PodTech.net’s Michael Johnson investigates the changing landscape of the home, thanks to Intel‘s Core2Duo dual core processors, and the next generation of Core2Extreme and Core2Quad, featuring four compute engines on one chip, which is ramping up the possibilities of digital life from downloading and recording viral videos from YouTube to wireless networking of the home to accessing movies on demand. Intel is at the forefront of revolutionizing the way we live, the way we communicate, and the way we entertain each other, through social media interactions to our family lives. It is a new world with ever increasing mobility, speed and efficiency. Who would have thought that such a tiny chip could hold so much power? Intel did. I’m Michael Jones and we’re here at the Intel booth at CES International. And we’re with David Marsiglia from Intel. Hey Dave it’s great to have you here. Hey, thank you very much. Tell us a little bit about what we are looking up behind us. Talk about recording Web video and using — really utilizing the power of the Core 3 Duo processor? Exactly. Yeah this is one of the many demos that we’re actually showing here today, that really utilizes our — not only our Core 2 Duo processor, but really incapsulates, it incapsulates our whole Intel Centrino Duo mobile technology as a whole. When you see these videos they are great to see, but that’s really all you can do is, just view them online. What you can’t do, is download them, because these are streaming videos. Until now that is. We’ve actually worked with a company called (Inaudible) which actually optimize to really excel on a Core 2 Duo Processor, part of our Centrino Duo platform. So, what this software enables you to do, this is the user interface that we have here, which really is built upon the Firefox browsers, and then they’ve actually incorporated their own engine and filling system in it as well. What you do is, utilizing their software you can go on YouTube, Google videos, or really anywhere that has unprotected streaming video, you can actually simply click record button and start recording, not only the video, but that entire page and for you to view off line and really take your videos with you on the go. So, you could be on an airplane and watch all those favorite videos here that you have recorded and just watch them anytime you want. We’re here with Merlin Kister of Intel. Merlin, tell me a little bit about what we’re looking at? Well this is the newest technology coming this year is the ability to communicate between your PC and your TV set, to be able to enjoy all of the content, your movies, your music, photos and even some new services that are accessed and available on your PC on big-screen TVs. The Core 2 Duo makes the small form factors possible. We give you a high performance processor that’s very energy efficient, allows you to view that stream that content over to connect to electronic devices like this brand new Sharp TV. I know that we have talked before, like digital life or the (Inaudible) club and there’s a lot of fascinating things here. This has really taken things through the whole newsstand. Exactly, exactly. We’re seeing this convergence has with other technologies; so no longer will you have islands of content. So, consumers will be able to access – don’t have to worry about, “Well is that music file or is that located on my PC, or is it on my iPod?” Now, with these new types of electronics they can communicate with each other, consumers can get access to really their favorite media on the device and screen up their choice. 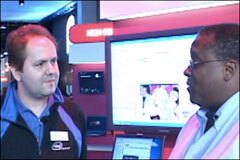 Merlin Kister from Intel thanks for showing me this great stuff. I’m not quite there with my TV set yet. Well it’s a great one to upgrade to. I know that it’s coming so, thanks for showing us.